Do you like apples, cucumbers, grapes, tomatoes, carrots, mangos, green beans, peppers, strawberries … ? If you like these, and many other fruits and vegetables, you can thank pollinators! Pollinators are true superheroes that help us and nature have the foods that people and other animals rely on. Often, we think of honey bees and bumblebees as the only pollinators, but there are many other types of pollinators that make up the superhero pollination force! Come learn about theses many pollinators, how pollination happens, and what you can do to support them. Bee ready to learn, hear a story, observe pollinators up close, and plant your own flower to take home! All Mighty Acorns Club programs are on the first Friday of the month from 10:00AM - 11:30AM. Programs begin in October and end in May, and are geared for ages 3 - 5. Roost with The Bird Diva and a group of enthusiastic birders at the Grafton Inn! The Bird Diva will join guests at the dinner table in the Inn’s Garden Room. Hotel/Dinner reservations are to be made directly with the Grafton Inn. The Bird Diva leads an "in the field" Birding Bootcamp walk beginning at The Grafton Trails and Outdoor Center and wherever else the birds call us to explore. This program will help the attendee slow down and develop a deeper connection to birds, a deeper observation skill set, and build a foundation for deeper citizen science. Register early as this will be a small group! Breakfast with the Bird Diva at the Grafton Inn following the bird walk. The Bird Diva will be joining guests for breakfast in the Inn’s Garden Room. Breakfast reservations are made directly with the Grafton Inn (802-843-2248). Participants are responsible for purchasing their own meals/drinks. Breakfast is not included in the price of the Birding Boot Camp program on Saturday or bird walk on Sunday morning. Time in nature increases health, happiness, and well-being in kids. Unplug from electronics and reconnect with nature! Our Brave Bear camps include educational, hands-on experiences that bring children outside to exercise their minds and bodies. Summer rains summon an astounding variety of gourmet and medicinal mushrooms. Join us on a wild edible mushrooming adventure with The Mushroom Forager, Ari Rockland-Miller. Ari will give a colorful presentation introducing the region’s most distinctive and delicious species, followed by a guided foray in the rich woods nearby conserved by the Windmill Hill Pinnacle Association. It’s our 30th Summer Season! Celebrate with us at noon on Earth Day and stay tuned for more celebrations throughout the summer and fall. April is a time of change here in northern New England. The last of winter begins to fade away and the arrival of spring greets us! With the warmth of spring comes many new things. Plants sprout, leaves pop out of their buds, animals are moving, and new life is all around! Learn about all of this new life from sprouting plants to eggs and babies! Join us for a story reading, animal craft making, and a hike to enjoy the changing landscape! A big thank you to The Grafton Inn and Phelps Barn for sharing proceeds from this Tuesday, March 12th trivia night to the Nature Museum. We encourage all of our fans, friends, and NM family to make a night of it. $5 suggested donation. Come early for appetizer specials! Come on you smartie pants! This program is full; please join our waitlist should a space open. On Saturday, March 9th join us and Chris Bernier, wildlife biologist with the Vermont Department of Fish and Wildlife, for an unique outdoor exploration. Bernier, who will be accompanied by Jay DeGregorio, Senior Environmental Educator at The Nature Museum, will lead a 4-hour nature immersion for a small group of participants. Space is limited for this exclusive winter exploration opportunity. Be sure to register early to avoid disappointment. We will begin at the Grafton Trails and Outdoor Center. After an introduction indoors, we will caravan in vehicles to a nearby access point for the Turner Hill Wildlife Management Area, which is home to numerous beaver-influenced wetlands and unique forest communities. Chris Bernier will lead our educational snowshoe trek stopping along the way to discuss types of habitats, animal tracking tips and tricks, forest management, and land conservation. Some of the common mammals seen during the year at Turner Hill are bear, moose, otter, beaver, muskrat, coyote, red and gray fox. This is a rare opportunity to enjoy this incredible area under the guidance of a marvelous nature interpreter and biologist. Participants can expect a moderately strenuous hike. Snowshoes and winter gear are required. Don’t have snowshoes? Reserve a pair from The Nature Museum when registering. Please note that the group will be outdoors in a remote location for several hours with no available facilities. Be sure to bring snacks/lunch and water. In case of inclement weather, the snow date for the workshop will be Sunday, March 10th. Space is limited- buy your ticket early for this one-of-a-kind winter exploration! Questions? Please contact Jay DeGregorio at jay@nature-museum.org. Do you like maple syrup on your pancakes? Maybe you like it better on french toast! Maple syrup is a true sweet treat of nature! Where does maple syrup come from? What happens to get it from tree to pancake? There is a lot that happens to make this magical sweet syrup. Come discover more about the New England tradition of maple sugaring. We’ll taste some local maple syrup, go on a hike in search of maple trees, and make a sugar shack craft! Wild Walkers is a partnership between The Nature Museum and Vermont Wilderness School, a Brattleboro-based non-profit. This day long outdoor adventure is suited for youth ages 10 to 14. This camp is being offered both Monday, February 18th and Tuesday, February 19th. Attend either or both days! Brave Bears includes fun, hands-on indoor and outdoor experiences that cultivate a deeper relationship with the natural world. Youth will make new friends while learning about animals that live in Vermont– their winter adaptations and how humans track them - before embarking on a snowshoeing adventure in the forest and field, collecting clues left in the snow by wild animals. When you look at the landscape in Northern New England, it's hard to fathom how much life goes on out of sight. But, life continues almost secretly. To discover this winter world, you must look for and how to find the signs of their wanderings! Come learn about the many sneaky animals of winter and how to find the hints and clues of their winter wanderings. Feel real animals pelts, learn the basics of animal tracking, and be ready to head out on snowshoes to test out your winter animal detective skills! Snow falls, ponds freeze, and cold winds blow during the winter time in Northern New England. Surprisingly, many animals are still out and about! Come learn about the different animals of our region and how they survive the winter. Investigate animal pelts, paws, wings, and feathers to get a closer look at some of these animals adaptations. Take a look at tracks and what clues to look for in the snow and ice. Bring your warm clothes and sense of adventure to go on a snowshoeing expedition in search of winter animal tracks and signs! The leaves are gone, nights become cold, and snowflakes fly as chilly winds begin to blow! The first signs of winter are right at our doorstep. For us, that means getting out our winter coats, gloves, and hats! But, what do animals do to be ready for winter? Learn what animals leave for winter, what animals sleep for winter, and what animals stay out and about. Come investigate fur, feathers, and more to learn about the different ways animals survive the winter months. This autumnal program for families will explore Native peoples’ traditions of living in balance with Earth, the seasons, and other living things. This program will highlight the Native Americans of the local region, the Abenaki. Come discover hands-on artifacts and learn of the deep understanding, respect, and connectedness the Native people of our region have with the natural world. Be ready to go on a hike to test your observation skills and immerse yourself in the outdoors. Imagine a world without computers, cell phones, cars, stores, and houses. Here in Northern New England, there was a time when none of these things were around! Everything came from what you could find, hunt, gather, and make from the land. For thousands of years, the indigenous Abenaki people have lived in harmony with the land and have gained a deep knowledge and respect for it. Come learn about what life was like before our time and how living closer to the land made people more connected to nature. Investigate Native American artifacts, hear Native American stories, and go on a hike outdoors to connect with nature! Fall is a time of change in Northern New England. There are so many new colors, smells, and even tastes! Leaves are changing, apples are ready to be picked, pumpkins are big and orange, days become shorter, nights become cool and crisp, and animals are preparing for winter. Come learn about why fall is a special time for the many plants, animals, and humans who call Northern New England home. Try some apple cider, learn about what fall means for critters and plants, and go on a nature scavenger hunt to see fall with new eyes! Thank you to everyone who came out and visited us at the Bellows Falls Fish Ladder and Visitor Center this season. We kicked off this season with a special opening party with master diver Annette Spaulding, who shared with us some of the many treasures she's discovered during underwater explorations of the Connecticut River. If you haven't had a chance to stop by the center, which is generously sponsored by Great River Hydro, your final chance falls over Labor Day Weekend. The center will be open for its final day of this season on Saturday, September 1st from 10AM-4PM. On both Friday and Saturday, our Environmental Education Intern Farrin Sofield will lead a special presentation, "All About Black Bears", for all ages. This program is free, as is admission to the center. While our museum is typically open every Saturday from 10am-4pm through the end of September, we will be closed on Saturday, September 1st to give our staff time off for the Labor Day Weekend holiday. Looking for something to do? This is your last day to visit the Bellows Falls Fish Ladder and Visitor Center for this season. Calling all adventure seekers! Let's explore Grafton! What will be find around the next bend? Hiking, stream trekking, tree climbing, country road rambling, and excellent excursions await our campers! Enjoy a journey to the bottom of the Earth with Will and Laurie Danforth, board members of The Nature Museum, as they share their recent month-long expedition to Antarctica. Join The Nature Museum and diver Annette Spaulding, who has been diving in the Connecticut River for over 30 years, for the grand re-opening of the Bellows Falls Fish Ladder and Visitor Center on Saturday, June 23! From 10 AM to 4 PM, Annette will be sharing stories and showing artifacts she has found on her dives. Meet with Annette and ask her about her life as a diver: What’s it like to find a shipwreck underwater? How did she get trained as a search-and-rescue diver? Which artifact intrigues her the most? Which animals has she seen swimming near the fish ladder? In addition to Annette’s sharing of her knowledge and artifacts, The Nature Museum’s environmental educator, Jay DeGregorio, will be leading an interactive program at 10 AM for free! The public is invited to stop by for Jay’s program, meet with Annette and ask about her diving adventures, and then take their time perusing the Visitor Center exhibits, which guide visitors of all ages through the ecology of this amazing river and its habitats. Learn about the fish, reptiles, amphibians, mammals, and birds who live here. 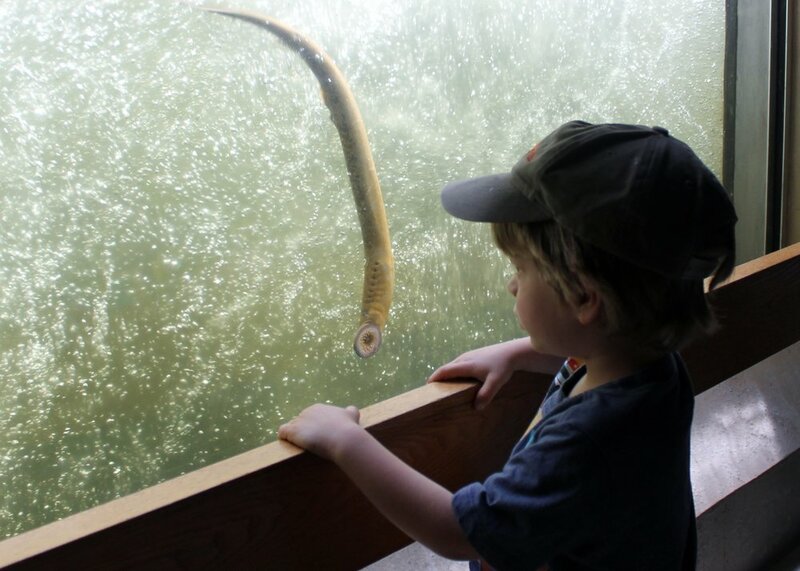 Walk below the water level and watch the water rush past- you may see a sea lamprey suctioned onto the window. Discover the history of the fish ladder, and be sure to meet the newest member of the fish ladder team: Bernie, a full-size, historic diving suit used in the 1970s by technicians at the fish ladder!